Home » The fall of Mussolini: The dictator, who vainly believed in Hitler's "miracle weapon"
On the night of July 25, 1943 in Rome, in the Palazzo Venezia, the fate of Benito Mussolini, who had ruled Italy since 1922, was decreed, who at the time of his fall was not only the Duce, the leader of fascism, but also the head of the government and the foreign minister. This happened after Italy lost its empire in Africa, the defeat of the Italian troops in Egypt, Libya, Russia, surrender in Tunisia, the landing of the Allies in Sicily and the first bombing of Rome. It was the last straw for the Italian tops - and the royal court, and the leadership of the army, and even the fascist party, forced them to start acting. And this was the last argument for Mussolini himself to stop clinging to power, and for the people - to support him. Mussolini realized that after a brilliant beginning and many successes, he led his country and people into a dead end, creating prerequisites and getting involved in World War II, which Germany would not dare untie, not having Italy as its ally. He unreasonably got into a big war with an army and country that was completely unprepared for it financially and morally, without having the necessary resources for it, making himself and the Italians hostage to Hitler. Duce was sure that the Fuhrer, with whom he was bound by the complex relationship of love and hatred, would win, and expected to take part in the division of the world as a younger, but respected by the Germans for his old merits partner. In the summer of 1943, this mirage was dispelled. And Mussolini could only rely on Hitler's "miracle weapon", which was never used. And to count on power in Italy or its part, he could only as a German puppet, which then happened. Meanwhile, the Italians lost Sicily, not wanting to fight the allies who landed there, which many did not consider enemies. Mussolini's compatriots were horrified by the prospect of bombing Rome, Florence, the destruction of countless cultural and artistic monuments in their country, as happened in Monte Cassino. They did not want to starve, although they never experienced a real famine during the war, and especially never before, to receive "funerals" from countries occupied by the Axis forces, where Italian troops suffered painful losses from partisan actions, such as in Greece or Yugoslavia. The 60-year-old Mussolini was already unable to hold on his shoulders and his energy, who entered the stagnation zone and parasitized only his charisma fascist regime. His health was also shaken - he was sitting on a strict diet, scooping a dubious inspiration in the arms of the young lover Clara Petachchi, whose family cynically used this connection for state intrigues and own enrichment. In such a situation, a meeting of the Big Fascist Council, which had not been assembled for a long time, took place. Its participants pursued various interests, trying to find a way out of the situation, having prepared and voiced for this purpose three different draft resolutions, and even voted for them. Earlier at the meetings of this advisory body this has never been practiced - there were only discussions, and the decision was made by the Duce. He did not arrest his comrades in many ways precisely because he doubted his ability to do this, since all three options for further action provided for his removal from power. The differences between them were different. The draft of the old fascist, famous diplomat and head of the lower house of parliament Dino Grandi, who received the largest number of votes, was aimed at Italy's withdrawal from the war. 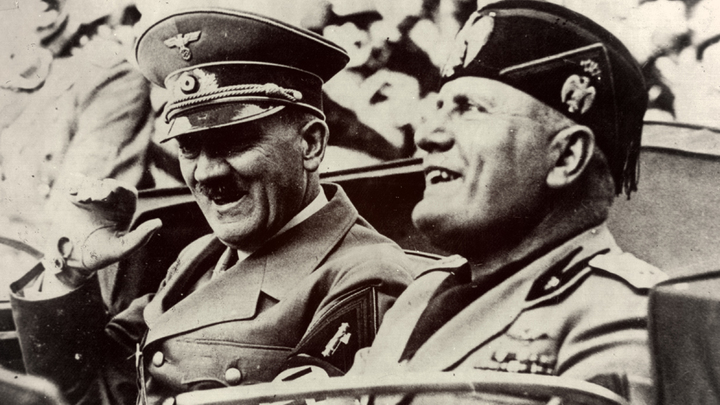 He also envisaged the formation of a government without fascists and the attack of Italian troops on the German units stationed in the country in order to win the favor of the anti-Hitler coalition and conclude a truce with the allies. Two other projects that received less support, on the contrary, provided for a series of measures to mobilize the country for a decisive war with the Allies under the leadership of the fascist party on the side of Hitlerite Germany, with the removal of the "tired" and exhausted Mussolini from the real governance of the country, as he was reasonably suspected of intentions to conclude peace with the Anglo-Americans. The Italian dictator tried several times to press Hitler on the pressure of the army and court, but he did not have the courage. After a stormy many-hour discussion, Mussolini was forced to sanction a vote on all three projects under the pressure of Grandi, who appeared at a meeting with two grenades. Moreover, it was not legally binding in the conditions of the existence in the country of the unrevealed Mussolini of the royal power. He often threatened to do this, but he did not, and was forced to report to the king every week of his reign every week, which was considered formally, but still, the highest power in Italy from 1922. Despite the "era of fascism", the adoption of "fascist laws", Mussolini ruled the country on behalf of the monarch, who was the source of executive power. Therefore, even in the event of the decision of the Bolshevik fascist council to displace Mussolini, only the king had the right to dismiss him from the post of head of government and appoint him a successor. Mussolini warned his companions that the draft resolution Grandi put an end to fascism, and that the allies would not be satisfied. He did not support other projects in order, he said, not to "substitute" the loyalists who remained loyal to him. He stated that he was ready to part with life if necessary, that he could still win the war, although he would not tell how. I meant, most likely, Hitler's nuclear weapons. The participants of the meeting were embarrassed by his speech, but only: the draft Grandi was approved by 19 votes to 8. Count Galeazzo Ciano voted against Mussolini even to all. Duce recognized the result of the vote, apparently with an internal relief. For the species, he argued that this was only a "recommendation" for the monarch, but his mistress Petachchi honestly immediately said on the wiretapped phone: "It's over." Mussolini, who loved the pose and drama, called the event "the greatest watershed in history". His own and German special services reported to him that a conspiracy had also matured in the palace, and the entangled dictator had hardly any illusions that his next report would be completed successfully by the king. He still managed to visit after a sleepless night, subjected to the brutal bombing of the allies of the Roman quarter of San Lorenzo, dined at his residence with his wife, Rachele, who begged him not to trust the king and not to go to the palace from where he would not return. But he had already made his decision. So it's over? It's over, it's over. But what will happen to me, with my relatives? ". The King assured him that none of them was in danger, and that he would personally take care of the safety of the former head of government. It meant arrest. The royal court was well prepared for this situation: the key points of Rome were taken under the control of loyal forces by the forces, the leaders of the fascist party were arrested in the capital, the fascist militia was dissolved. The big fascist council is the same as other authorities created by the ruling party. The people, who for many years applauded Mussolini as their idol and enjoyed the many blessings of his regime, happily tore off the emblems and flags of the fascist party from everywhere. With shouts: "Death of Mussolini, Down with Fascism!". No one stood up for his defense, even the highest party functionaries and activists were effacing, showing that everything really stayed on the duce and crumbled without it. Although Mussolini expressed his readiness to help the new government, he was naturally not trusted, they wished to give it out to the allies as soon as possible, and they wanted to arrange it so that he would be silent forever, because he knew too many common secrets. Mussolini was initially arrested in Rome, then moved to the island of Ponza, then to the islands of La Maddalena in the Tyrrhenian Sea, eventually to the high-altitude resort of Campo Emperor in Gran Sasso. From there, the former duce was rescued on September 12 by Hitler's chief saboteur Otto Skorzeny with his dashing SS commandos. This happened a few days after the new Italian government announced its surrender, after which the country was quickly occupied by the Germans, except for the southern part, which was occupied by Anglo-Americans who landed there. Then Mussolini, who never managed to get out of the game, was still identified by Hitler as the nominal head of the "Italian Social Republic" controlled by the Germans. He had to witness - and partly responsible - for the brutal civil war that began at the end of 1943 in Northern and Central Italy, among the most recent victims of which he himself, with his mistress, Petachchi, and the most loyal Fascist functionaries, who remained faithful to him. They were executed in the last days of the war with truly ferocious cruelty. In the case of Mussolini, not only the Italian Communists, but also the British special services, made a hand in this. In London, they very much did not want a trial of their former agent, who was invented by the British special services during the First World War for the prophetic nickname: Il Duce.